I have said before that I love my followers. I do! Big hugs! I also enjoy meeting new people. 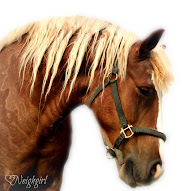 One of the reasons I started this blog was to share my country life with others. I would love to be able to physically have this event on our farm, but I cannot do it in person right now. Indulge me! This will be fun online. I would like you to have a picture of this event in your minds before you join in the festivities. I love fall. The trees are beginning to turn colors. Imagine a large pasture. Yup! Check! We got it! Imagine that I have set several long tables end to end in that pasture and draped them with old quilts. Cool! We can handle that! Now picture straw bales placed around the tables as benches. There are pumpkins, candles and fall mums decorating the tables. Sounds pretty! Further this picture by envisioning six very nosey horses on the other side of the fence watching as all of us as we "meet and greet." Why can't the horses meet and greet? Neigh-and eat! Here are the rules:1. Follow me on Google Friend Connect. If you already follow, I'm sure I know. If not, join in the fun.2. Answer the following 5 questions in a post on your blog. Pick up the lovely button above. The first button Patrice ever made. She had a little help. Oh, hush! If you don't have a blog, just answer in the comments section.3. Link up below.4. Watch for my giveaways through the week. I think you'll enjoy some of the things I have for you. Each giveaway will require comments and there will be ways to get extra entries.Here are the questions:1. Who would you bring with you? (You don't have to use your real names if you wish.)2. What will you wear to the party? (Remember, it's 60's in the daytime and 40's at night.)3. What would you most like to see on my farm?4. What dish would you bring since it's pot luck? (Optional: You can post a recipe or photos of a dish if you'd like.)5. What game or activity would you like to do during our get together? 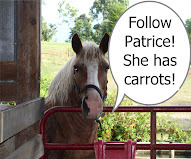 Neigh- You could play give the horses carrots! Oink-oink. Maybe a rousing game of chase the pigs! Oh, cut it out, you guys. These are MY guests. Don't frighten them away! I love, love, LOVE this blog party! Hope you don't mind, if I come and bring mom to, do yea, it sounds like fun. I will get going on the post right away. As soon and I figure out how to put the button on my site I will. I know there is a easy way but for the life of me I can't remember. I broke my site earlier this summer and it took me a month to get everything back so I am slow. 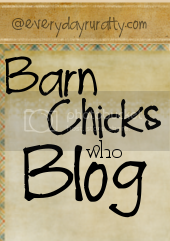 Yes, of course you can do a blog post after your barn party! :) I am so amazed it got there so soon, I did think it would get there until Wednesday at the earliest.One of the ladies on my site wanted to know if you would post pictures, so I thought that was cute. I loved the story about how God provided this morning. That is so sweet. I am amazed at the things God does for us all of the time. Where do I put the questions? by the way, your site or mine? Happy Blog-a-versary! Great job on the button, too! Happy Blog-aversary! I'll post the answers to your questions to my blog, I'm still trying to figure out what to wear (LOL!) but I have my dish all made and sitting in the refrig until I'm ready to leave for the party! I'm in, promoting you on m blog, and will get my questions answered and posted by tomorrow. Good luck! I am now following you thanks to Meet Me Monday blog hop, and it would be nice if you could share the love back on my blog;) Also don't forget, if you need any help increasing your blog's traffic or easy blog design tutorials, you know where to come! I finally made it to your party - check out my blog! Hehehe! We coerced Moma into taking a quick peek at your earlier blogposts, even though she said (a gazillion times) she was gonna help us catch up tonight. (We've been gone tooo long.) But she's a pushover and we got her curiosity aroused. It wasn't hard to do. Everything you write about is the sort of thing that Moma loves. So. Here we are. Too late to come to the party, but NOT to late to enjoy it's story. We're happy to meet you! And now we're gonna go read more ... though we probably won't get the luxury to comment. Yet. But someday we will. Promise!